Stainless Steel Stuffing Tube measures 1/2" in diameter. Base measures 1.67" or 4.25mm. 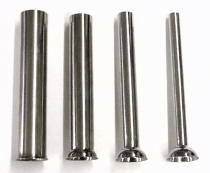 Stainless Steel Stuffing Tube measures 3/4" in diameter. Stainless Steel Stuffing Tube measures 1 1/4" in diameter. Stainless Steel Stuffing Tube measures 1 1/2" in diameter.